Dr. Marie Meyers always appreciates feedback from her valued patients. To date, we’re thrilled to have collected 9 reviews with an average rating of 5 out of 5 stars. Please read what others are saying about Dr. Marie Meyers below, and as always, we would love to collect your feedback. Just received a hydrafacial along with dermaplane by Megan. Fantastic service. I love this medical spa for all they have to offer, the beautiful atmosphere and kindness of the staff. There isnt anyone more sincere than Dr. Meyers. She helped erase some problem areas 4 years ago when I was approaching 70. Although I don’t go as often as I would like, when I do get an appointment, she is always honest and I totally trust her suggestions. She has a gentle soul whose welcoming smile brings calmness to the hello you hear in her voice. Dr. Meyers is like no other; therefore, I will never go anywhere else! Dr. Meyers has cared for me for years and I'm just so delighted for her, now that she has her own beautiful, bright medi-spa. This truly is a top-notch experience! Happy to have found her again! Wow, what an amazing staff you all have. This went above and beyond my expectations. I had a dermaplaning and peel done and my skin looks radiant. I certainly didn’t expect one treatment to make such a beautiful difference. I will be recommending you and your team to anyone looking for a boost in their skin care. And Karlissa is just a gem. She truly knows cares about each individual and always speaks straight from her heart. Thank you ALL for the fantastic experience. Dr. Meyers is very nice and knowledgeable. The staff at the Spa are wonderful! I chose to do the laser hair removal and so far I am very pleased with the outcome. 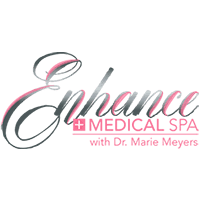 I highly recommend Enhance Medical Spa! Dr. Meters and Karlissa were so kind and made me feel right at home. Extremely inviting and professional! I’ve been a patient of Dr. Meyers for years now and always have enjoyed visiting her! She and her team are so nice! I would highly recommend scheduling your next visit with Enhance Medical Spa to see for yourself how wonderful they are!